When I tell people I study snails for a living I get one of two replies. There’s either some version of the “joke” that goes “that must be slow-going” or “sounds action packed”, or there’s “oh, you mean those giant killer ones we saw when we went tramping?”. I guess the joke is funny enough, but I want to make it clear that those giant killer snails from the family Rhytidae, cool as they might be, are not the most interesting land snails in New Zealand. 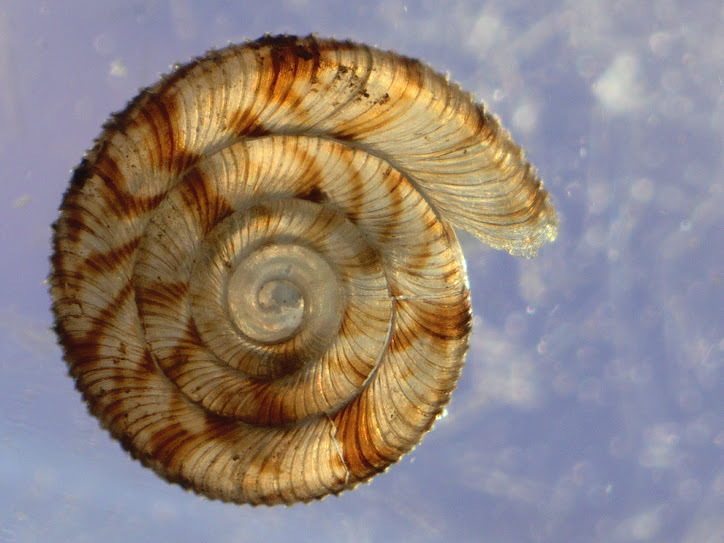 The local land snail fauna displays a pattern that is quite common for New Zealand animals – we have a very large number of species but those species are drawn from relatively few taxonomic families. Since taxonomic groups reflect the evolutionary history of the species they contain, that pattern most likely arises because New Zealand is (a) quite hard to get to, so few would-be colonists make it here and (b) full of ecological niches and geographic pockets that can drive the formation of new species. In total, there are are probably about 1200 native land snail species in New Zealand – about ten times the number found in Great Britain, which is approximately the same size. That diversity extends to the finest scales – individual sites in native forest might have as many as 60 species sharing the habitat. New Zealand forests probably have the most diverse land snails assemblages in the world (although tropical ecologists, who generally hold that diversity in terrestrial habitats almost invariably increases as you approach the equator, have argued against this conclusion). You may now be asking why, if this land snail fauna is so diverse, have you never seen a native snail. Well, you’ve probably walked past thousands of them without noticing. Most of our native land snail species are from the families Punctidae and Charopidae, groups that are sometimes given the common name “dot snails”. Meembers of these families are usually smaller than 5 mm across the shell, and are restricted to native forest and in particular to leaf litter. But in native forests, where there’s leaf litter there’s snails. Grab a handful of leaves, or pull up a log and you’re likely to find a few tiny flat-spired snails going about their business. Hell, down here in Dunedin you can even find charopids living under tree-fuschia in a suburban garden. Like so many native invertebrates, we know very little about our land snails. Lots of people have dedicated substantial parts of their lives to documenting and describing the diversity of these creatures, but even so we don’t have a clear understanding of how the native species relate to each other or to their relatives in the rest of the world, or even where one species starts and another ends. Without such a basic understanding, its very hard to ask evolutionary and ecological questions about these species, so for now we remain largely ignorant of the forces that have created the New Zealand land snail fauna. For the time being I can tell you that a lot of them are really quite beautiful. Since most people don’t have handy access to a microscope to see these critters, I thought I would share a few photos from this largely neglected group over the next few weeks. The 2D photographs, with the relatively fine depth of field, don’t quite record the beauty of these 3D shells, but I hope it’s at least a window into the diversity of these snails. Let’s start with a snail that is very common in Dunedin parks and forests. This is a species from the genus Cavellia (the strong, sine-shaped ribs being the giveaway) but I won’t be able to place it to species until a new review of that genus is published. 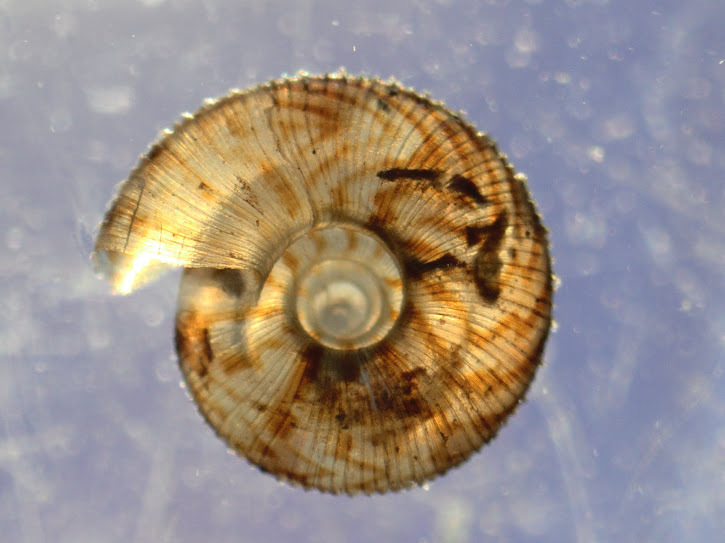 This particular shell is from an immature specimen, and is about 2mm across. When flipped, you can see an open umbilicus that lets you see straight through to the apex of the shell. I take it that the big lumbering beasts that infest my garden are imports? Yeah, the larger garden snails are Helix aspersa which, like the most commonly encountered garden slugs, are introduced pests. I don’t think any of the natives would eat garden plants.